An over-flow collection [next time : a live-stream projection to accompany the audio feed. please.]. 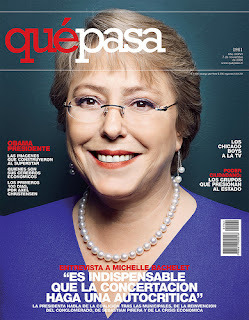 Of extraordinary accomplishment : President of Chile. Surgeon. Minister of Defense. Mother. Hers is a trajectory of extreme accomplishment. Bachelet asserts a commitment ; a special interest where rural-specific tautologies are @ stake. So do I.
UNWOMEN depends on 3 things : Bachelet's 1. leadership. 2. imagination 3. determination. Bachelet is a "Renaissance woman" says Edie Samuels [Vassar '53] with a real-time mandate to engage --- 21st Century Realities. Holding up half of the sky; we must be still --- and achieve a sense of understanding; there is work to be done ---- within ourselves --- that is --- to acknowledge "that sexism dos not discriminate on the basis of gender; that we, as women; as men --- hold the power of emancipation's elixir in our hands." " Poverty is unnatural and equal rights [opportunities] for girls and women is a matter of the here and now; of our elevated sense of uncompromising justice." Moderator Elisabeth Lindenmayer [ http://www.sipa.columbia.edu/academics/directory/el2253-fac.html] listens to Bachelet. Lindenmayer's cohesively probing pivot-points of inquiry anchored Bachelet --- while she addressed the global rights and freedoms of women today ; and before them, our mothers; daughters, sisters. How tech-enabled; how mobile; how socially-networked will UN WOMEN be? Bienvenida! to UN WOMEN Under Secretary-General Bachelet! In you I have faith.